11.22.06 Richard Look wins his second Washington County Chess Federation Swiss Tournament scoring an irreproachable four points in four games. In a four-way tie for second with three points were Mike McCabe, Hoty Briggs, Rafi Hopkins and Nick Beal. 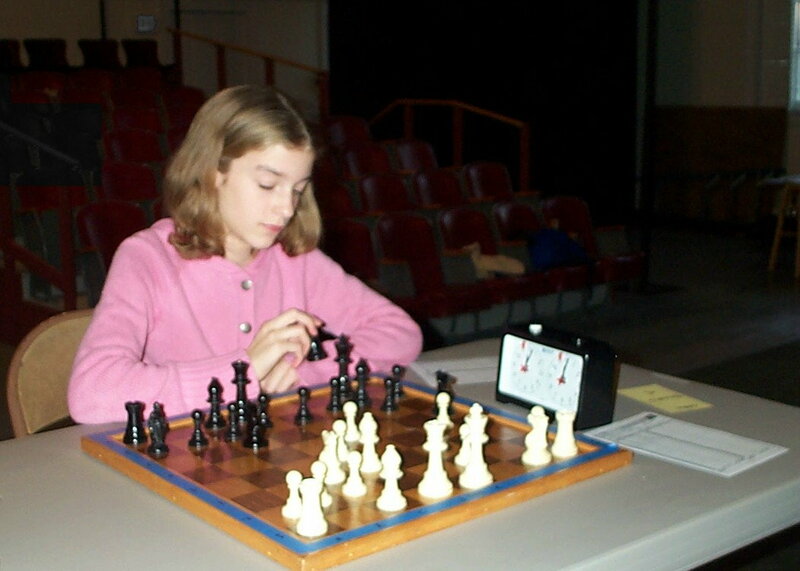 The four round tournament, held at the Eastport Arts Center on November 18, 2006, attracted sixteen players with ratings ranging from USCF 1789 to USCF 100. Click here for the USCF crosstable of this event. Thanks to Alba Briggs for contributing to this report. Prizes were also awarded to top players in the K-8 section. Ezra Briggs took first with wins over David Consalvi and Logan Thompson. Mary Briggs and Brennin Consalvi took second and third places respectively. This tournament was one in a series of monthly tournaments hosted by the Washington County Chess Federation. Watch the events link at ChessMaine.net for details of upcoming WCCF tournaments. The Chief Tournament Director and organizer was Alba Briggs. The massive organ at the Eastport Arts Center provides a stunning backdrop for players in the Washington County Chess Federation November Swiss Tournament. Richard Look plays the white pieces in the forground vs Mike McCabe while Tarik Benabdallah (right) assesses the position in his game vs Rafi Hopkins. Nick Beal's clock is running while he contemplates his next move in his game vs David Consalvi (left). The game ended 1-0. Jade Murdick took a point away from the wily Tarik Benabdallah to score two points in this tournament. Houton Smith plays the white pieces vs Tarik Benabdallah while Lily Briggs makes a move vs Rafi Hopkins in third round battles. Second in the K-8 section, Mary Briggs. Playing in his second USCF-rated tournament, Brennin Consalvi.